The 2014 finalists visited 3M's headquarters in St. Paul to conquer challenges and share their ideas with the panel of judges, including special guest Kari Byron of Discovery Channel's MythBusters! Meet Hannah Herbst, America’s 2015 Top Young Scientist. Inspired by her 9 year old pen pal living in Ethiopia who lacks a reliable source of power and electricity, Hannah created an energy probe prototype that seeks to offer a stable power source to developing countries by using untapped energy from ocean currents and submitted this innovative idea to the 2015 Discovery Education 3M Young Scientist Challenge. Chosen as a national finalist, Hannah worked one-on-one with a 3M Scientist Mentor to bring her idea to life and was awarded the grand prize of $25,000! As America’s Top Young Scientist, Hannah has traveled the nation to share her innovation appearing on Fox and Friends, Wake Up With Al and at the Social Innovation Summit in Silicon Valley. Meet Sahil Doshi, America’s 2014 Top Young Scientist. Inspired by the global energy crisis, Sahil developed an innovative new battery design called PolluCell and submitted his innovative idea to the 2014 Discovery Education 3M Young Scientist Challenge. Chosen as a national finalist, Sahil worked one-on-one with a 3M Scientist Mentor to bring his idea to live and was awarded the grand prize of $25,000! 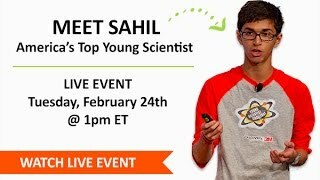 As America’s Top Young Scientist, Sahil has traveled the nation to share his innovation appearing on NBC News, Fox and Friends, and Wake Up With Al. 2016 Young Scientist Challenge Final Event Opening Remarks. 2016 Young Scientist Challenge Finalist Kaien Yang's Presentation. 2016 Young Scientist Challenge Finalist Mrinali Kesavadas' Presentation. 2016 Young Scientist Challenge Finalist Will Paschal's Presentation. 2016 Young Scientist Challenge Finalist Meghna Behari Presentation. 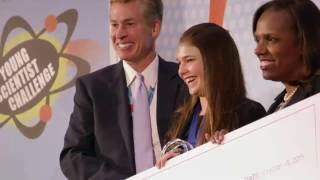 2016 Young Scientist Challenge Finalist Amelia Day's Presentation.